Associate Professor Colm Cunningham discusses the practice of disguising doors in residential facilities with Professor Mary Marshall. 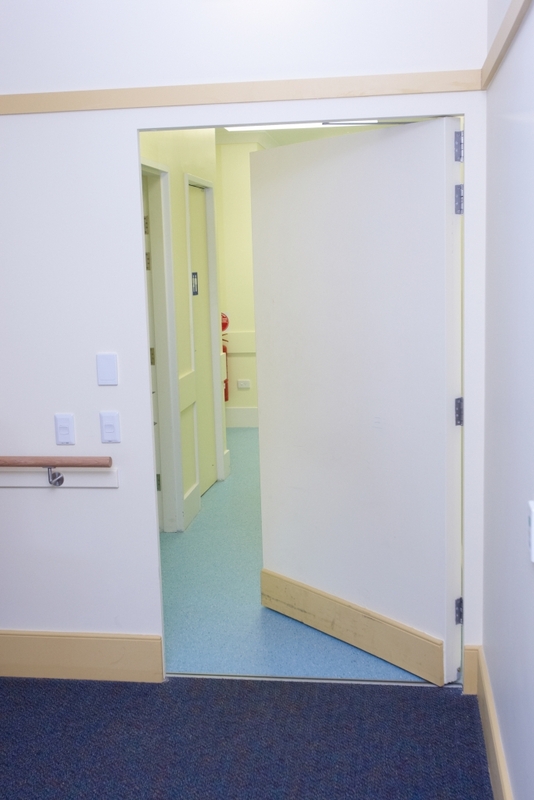 Disguising a door to stop a person with dementia leaving is commonly used in residential facilities. I could discuss at length the importance of first and foremost ensuring we understand the reasons and triggers that lead someone with, or indeed without, dementia to want to leave a building. Boredom, noise intrusion, lack of open spaces in a residential facility are just some of the reasons one could provide. Whatever the cause, investigating and seeking to understand why this is happening is essential. We need to avoid labels and assumptions being placed upon the person with dementia about their actions and to not routinely define these as a ‘behaviour’ of their dementia. I do, however, want to focus on and call into question a couple of solutions in common practice to disguise these doors. These include: the use of mirrors on the face of the door or disguising the door with an image of a bookshelf, welsh dresser, or in a most recent example, a café scene with chairs. Hallucinations can occur for at least 25 per cent of people with dementia and are typically auditory and/or visual. Sensory impairments such as hearing loss or poor eyesight that increase with age tend to exacerbate hallucinations in the older person with dementia. Certain types of dementia, for example dementia with Lewy Bodies, increase the possibility of visual hallucinations. There are also a significant number of older people at risk of delirium and associated visual hallucinations. Residential facilities who define their service as not for people with a diagnosis of dementia are therefore not exempt from the challenges created by a confusing environment. All of these factors mean that people living in residential facilities are at risk of visual misidentification of their environment. Why, then, would the answer to stopping a person leaving through a door be to create a solution that can add to their confusion? In the example of the image of the café scene with a chair being used on the door, this could put the person at risk of trying to sit on the chair with an outcome as serious as fracturing their hip in the process. Research-based evidence is lacking in this area. Cumulatively, the evidence about the changes in the ageing eye from visual impairment experts and the confusion that occurs to people with dementia are strong arguments in themselves. I have also observed the problems these strategies can create, for example a person with dementia trying to reach for a book on a bookshelf image. Looking to expertise and experience in the area of design, I asked Emeritus Professor Mary Marshall, University of Stirling, for her view on using an image to disguise a door. She told me: “It concerns me that we have to use trickery in buildings for people with dementia. Life must be bewildering enough with dementia, especially since many people are in a very unfamiliar environment. In the example of the café image mentioned above, it was observed that residents with dementia stated people were walking through the chairs. What residents were actually seeing was staff entering through the doors and the image of the café then being split open. A redesign of the environment and/or staff practices of where or when they enter the facility could help. The potential for the words of the person with dementia in this context to be assessed by a doctor or relative as further evidence of confusion and hallucinations is very real. The NSW Dementia Behaviour Management Advisory Services identifies environmental triggers as a significant factor in the referrals they receive. It is incumbent on residential facilities to ensure that they are not adding to a person’s confusion or indeed unnecessarily frustrating them. In my view, painted or printed images to disguise a door do not fit with what we know about changes to the ageing eye, problems interpreting 3D images and the risks of hallucination that are associated with having dementia. I’m with Professor Marshall that we need to pick up our paint brushes and paint these types of doors the colour of the wall. That is the easy part, the hard yard is what we do to change our care models and adapt our environments to enable people with dementia and create spaces they want to live in. Associate Professor Colm Cunningham is director of The Dementia Centre, HammondCare. One Response to When is a door not a door? We have recently disguised a contentious door in the DSU with timber look wallpaper which runs the length of a wall and over the door, blending it right into the wall. As there is outdoor access to a secure garden just nearby it has in this case solved the problem of residents trying to open the door and becoming agitated when it would not open, causing all sorts of behavioural ripple effects through the unit.